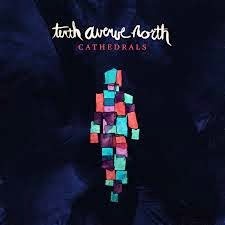 When I popped the new Tenth Avenue North album, Cathedrals, into my CD player, I secretly hoped that I would hear something other than ‘just another contemporary Christian band’. I had a craving for something different. But before I get into the review, here’s a little background info about this American based ensemble: They are a full on band, with Mike Donehey on lead vocals and acoustic guitar, Jeff Owen on electric guitar and vocals, Ruben Juarez III on bass guitar and vocals, Jason Jamison on drums and Brendon Shirley on keyboard. The group, who has had a few member changes since conception, had originally met at Palm Beach Atlantic University, releasing three independent albums before its major label debut with album, Over and Underneath in May 2008. They went on to receive the coveted Dove New Artist of the Year Award in 2009 and Song of the Year in 2010. Cathedrals is their fourth studio album and has already reached Number 1 on both iTunes and Billboard’s Top Christian Albums Chart. Lead, Donehey, had this to say about the album: ” ‘I am a cathedral of God’s spirit’ we’ve been told in Acts 17, we’ve been told in 2 Corinthians 6, we’ve been told in Colossians and Hebrews that we are a living temple of God’s spirit right?,” he asked and then explained his reasoning, “Now I’m not afraid of this big bad secular world. In fact now I know if the spirit of God lives in me, everywhere I go I make it sacred, just when I walk through the door.” According to Donehey, it was this very thought that inspired the title and content of the new album. “So many of us live in isolation and we really don’t have to,” he shared. “So the idea is: ‘Hey get in the boat with us, sail by the stars of God’s promises and reach the shore of community.’ We realize that when we start to live together, we become the cathedrals on earth. We are the place where the spirit resides. It no longer dwells in buildings but in each of us.” Powerful stuff! The band has penned most of the album themselves – which I found impressive. I love that they write together as a collective. This album was written while on the road and only features 1 or 2 guest writers, which shows the amazing unity in the spirit between the band members – which is something that I admire. Right. So when I popped the new Tenth Avenue North album into my CD player, hoping to hear something different, I found exactly that. I actually started smiling during the first few seconds of the album opener, “No man is an island.” With a sound that filled the atmosphere, Donehey begins singing, as God, beckoning us to build community and not live this life alone. Great album opener! The following track, “Stars in the night” made me intensely aware of their amazingly sharp song writing skills. These guys have something to say and want to say it straight up – no sugar coating. This pop rock song starts off with a melodic piano riff backing the vocalist who sings: “No matter where you lead we want to follow you/Trouble is we forget who we belong to.” It later on goes on to speak about grace making a way through, even when we are filled with shame and brings across a message of hope and redemption. And then the album shifts into yet another genre of rock with song “I need You, I love You, I want You”. It feels a bit out of place on this album, but totally works, serving as a nice break away from the more mid and up tempo pop rock songs. It is through and through a worship song and its title literally says more about the song than my description of it ever could! “The Spark” and “Closer”, have a much more mainstream sound. The latter has a catchy piano intro and hook. I love that they don’t ‘mince’ their words and keep lyrics to the point. The bridge, for example, says: “Well I’m embarrassed to admit/The distance I’ve been feeling/Has all been self-imposed.” I love honest lyric that puts things into retrospection. The brutal honesty in “We won’t numb the pain” made me wince! The track speaks about the cheap thrills that so many in the world are falling for and really hammers home a declaration with a bridge that sings: “We won’t number the pain!/Hands reaching to the sky/Hearts ready for the fire/Eyes open til we die”. I especially love the 2nd half of the song, which is really more like an outtro, titled “Fire”. It breaks down into a melodic guitar riff and Doneheys hauntingly beautiful vocal asking God to give him “one glimpse of Your lovely light.” It really is stunning! The simplicity of “All the earth is holy ground” rounds the album off nicely, summarizing the message that the band had wanted to share with this compilation. The Deluxe Edition features 3 more songs: “Just getting by”,“Forgive me” and “For those who can’t speak” which features Derek Minor and KB. As a Tenth Avenue North newbie and first time listener, I can wholeheartedly say that I thoroughly enjoyed this album. The songs are all written with the heart of the message in mind, the production is well thought out and the vocals are on point. I get the feel that each song was assembled in a way that is quite bold – an indication that they have been on the music scene for a while and are confident with their sound and know where they are going to. If you are looking for something fresh, easy to listen to and real, give this one a go! Listening to this album made me feel like I had just been on scenic journey and I was left feeling spiritually refreshed.